I have SO much to share with you! It was so amazing to be in the company of so many creative people and I left there inspired and ready to stamp and create! I will be posting designs and ideas in the coming days and weeks so I hope you stop by often. 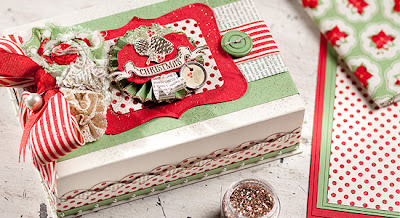 This first one is the Christmas Keepsake Box (a $40 value) that is FREE when you join our SU! team from now through July 31st. Here's a photo of the completed bos..... Isn't it gorgeous? It's even prettier in person!! The starter kit is only $99!! (It's $185 worth of products and supplies) It is completely customizable so you can change any of the stamp sets, ink pad colors and cardstock to get exactly what YOU want to have. Whether you want the kit at this low, low price to be a "hobby" demonstrator and enjoy the demonstrator discount on all your "must haves" or if you are looking for a way to make a little extra spending money, this is a fantastic opportunity. Send me a note or give me a call and I can give you all the details. to go to my website and click on "Join The Fun" to see all of the products that are included. It's such an exciting time to become a part of the Stampin' Up! family.